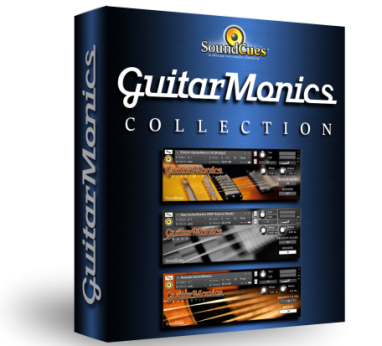 SoundCues GuitarMonics Collection KONTAKT screenshotAcoustic GuitarMonics is a virtual instrument for the Native Instruments Kontakt 4.24+ software sampler (full version, not the free Kontakt Player). Mapped across 4 octaves, this library is a comprehensive collection of acoustic guitar harmonics covered by 3 dynamic layers and 5x round robin playback of its stereo samples. SoundCues GuitarMonics Collection KONTAKT screenshotElectric GuitarMonics is a virtual instrument for the Native Instruments Kontakt 4.24+ software sampler (full version, not the free Kontakt Player). Mapped across 4 octaves, this library is a comprehensive collection of electric guitar harmonics covered by 3 dynamic layers, 5x round robin playback, and 3 pickup selections to alter the tone. Mono DI (direct-input recording, for use with amplifier simulation software / hardware) and clean stereo AMP versions are included, for maximum flexibility. 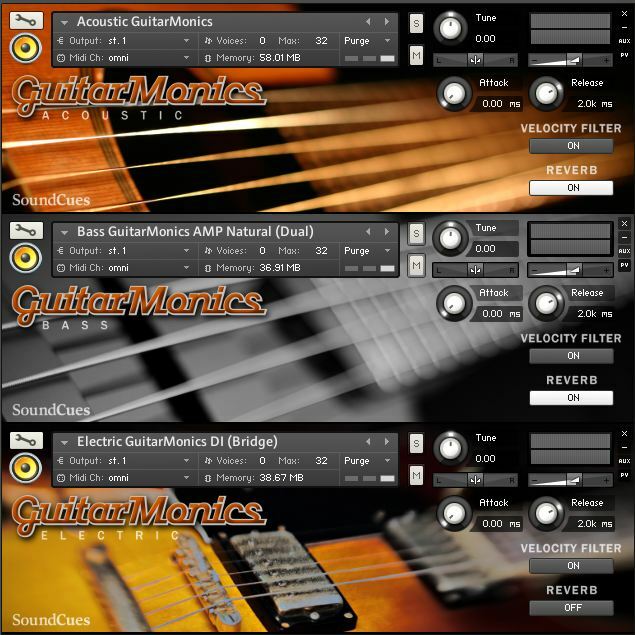 SoundCues GuitarMonics Collection KONTAKT screenshotBass GuitarMonics is a virtual instrument for the Native Instruments Kontakt 4.24+ software sampler (full version, not the free Kontakt Player). Mapped across 3 octaves, this library is a comprehensive collection of electric bass guitar harmonics covered by 3 dynamic layers, 5x round robin playback, and 3 pickup selections to alter the tone. Mono DI (direct-input recording, for use with amplifier simulation software / hardware) and clean stereo AMP versions are included, for maximum flexibility. In addition, this library includes two sets of samples - "Natural" and "Pure", which offer originally-recorded samples with authentic tone and samples edited for faster playing, respectively.